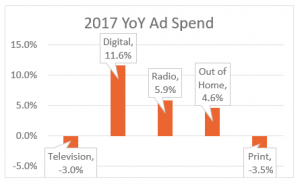 US Ad Market Grows by 3.7% in 2017 Ad Spend on National TV Drops, While Digital, OOH, and Radio Grow Standard Media Index, the only advertising intelligence firm to source detailed and complete data directly from the major media holding companies, today unveiled updated advertising revenue figures for December 2017, Q4 2017, and the full 2017 calendar year. “Heading into 2018, ad spend in National Television is trending positively while Digital’s growth continues to slow.” said Standard Media Index CEO James Fennessy. “National Television declined in 2017, but that is almost entirely due to the Olympics in ‘16. We see national brand advertisers paying really high CPM’s for quality drama, and sports programming, despite falling audiences. This speaks to the power of TV to reach audiences with their brand message via a full screen experience with no fraud.” December 2017 In December 2017, the total advertising market was flat. Digital rose +6% in the month compared to December 2016. Social Media and Digital Content sites saw the largest increases at +23% and +12% respectively. Additionally, December saw a +16% increase in out-of-home (OOH) with a decline of -9% in Radio. National Television ad spending rose +1.1% year-over-year in December 2017 with a +1.9% increase in Cable and +0.1% increase in Broadcast. Cable news saw a sharp increase of +27.2% overall, with growth of +23.4% at FOX News, +35.6% at CNN, and +56.9% at MSNBC. This rise is largely due to spend increases on news talk shows, including Tucker Carlson Tonight and The Ingraham Angle on FOX News and AC 360⁰ on CNN. Meanwhile, news programming on Broadcast declined -1.0%. NBC News programming lost -2.8% in December, which comes on the heels of the firing of Matt Lauer. NBC's TODAY, whichLauer hosted,**declined -24% in December compared to last year. 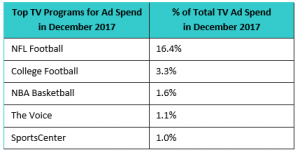 NFL Football remained the largest source of TV ad spend in December, although that amount dropped -3.0% compared to December of last year. While sports as a whole have declined -3.4% this month, four out of the five largest sources of TV ad spend were sports programs. Q4 2017 Throughout Q4 2017 (Oct. – Dec.), the overall ad market continued its positive trend, rising +4.4% compared to Q4 2016. National Television fell -0.1% with a -0.4% decrease in Cable and a +0.5% increase from Broadcast. NBC was the Primetime Entertainment leader for the quarter, growing +5.6%. These gains are largely due to This Is Us, which earned the highest spend of all Primetime dramas in Q4. In Q4, Digital and OOH carried the overall market, each with a +10% increase year-over-year. Radio is up +1.0%. Digital, Search, Content, and Social have all seen double digit growth. TV Network Digital is close behind at +9% growth for Q4 compared to last year. Ad spend on Internet Radio continues to grow, with a +5% increase in Q4 2017 versus Q4 2016. 2017 Calendar Year Through the entirety of 2017 (Jan. – Dec.), the advertising market grew +3.7%. Digital led the growth with an +11.9% increase. Cable TV dropped -2.4% while Broadcast declined -3.9%. CBS, NBC, ABC, FOX, and ESPN were the top five networks, bringing in a combined 42.4% of the television ad dollars in national. CBS declined -4.2% YoY, mostly due to the loss of the Super Bowl. The latter went to FOX, which posted +14.2% YoY growth. ABC dropped -2.3% and NBC declined -15.5%, which is entirely attributed to the impact of Olympics in 2016. Excluding the Olympics, NBC would have been +4% for the year, and the overall National TV market would only have declined -1%. In 2017, across all platforms, News media saw +4.1% more spend, Entertainment programs were flat at -0.8%, and Sports declined by -12.0%. Excluding the Olympics, Sports declined -1.3% YoY. On the other hand, despite the end of the election cycle last year, Cable News has continued to grow in 2017. FOX News increased by +11.2%, CNN by +13.6% and MSNBC by +17.8%. Ad spend at the Big Three Cable Networks has grown YoY in 10 out of the 12 months of 2017. 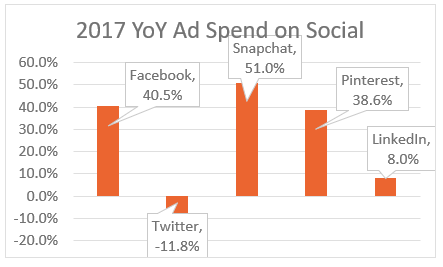 With the only exception of Twitter (-11.8%), all the major social network sites delivered growth in 2017. Facebook (including Instagram) posted +40.5% growth in US ad revenue within the SMI Pool of agencies, with Snapchat closing the year at +51% growth after tremendous growth in the first two quarters of the year and a marked deceleration in Q3 and Q4. Advertisers by Category Looking at advertiser categories across National TV, the Auto industry (-13%), Prescription Pharmaceuticals (+8%), and Food, Produce & Dairy (-4%) had the largest spend in 2017. The Travel industry (+16%) and Non-Alcoholic Beverages (+10%) led the market growth YoY. Meanwhile, the top declines were from Entertainment (-16%), Autos (-13%), and Telecom (-12%).